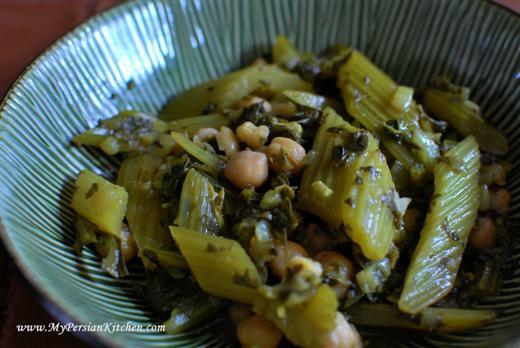 Those of you who have seen and read the first Khoresht Karafs post will remember me mentioning that this celery stew was the first khoresht that I converted into vegetarian back in the days when I was a Pesco-Vegetarian. Well here it is now: THE vegetarian, and vegan, form! When we went to the Farmer’s Market on Saturday we bought this gorgeous head of celery with lots of leaves attached to it. It simply screamed for a celery stew. I also used some of the herbs that I had chopped and placed in the freezer a few months ago. You can read all about that post by clicking here. Small dice onion and mince garlic. Sauté in oil until translucent. 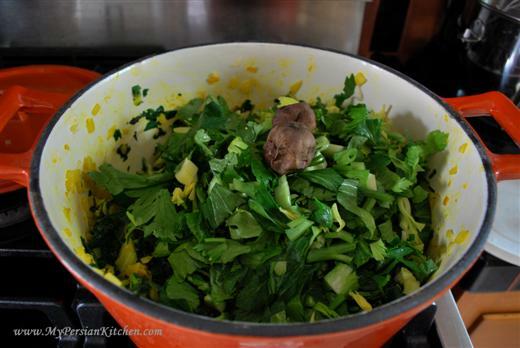 Add turmeric and cook for a few minutes longer. 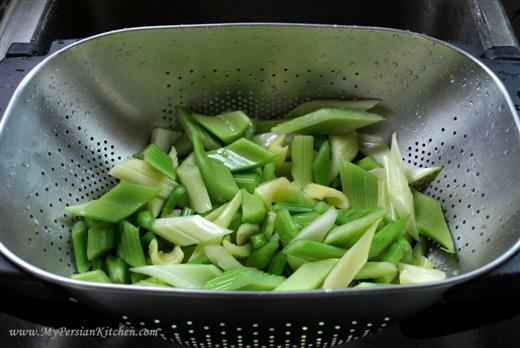 Cut the celery sticks into about 1 inch pieces. Wash and drain all water. Add celery to the onion and garlic mixture and sauté for a few minutes. In the mean time chop all the celery leave and herbs. Add the herbs to the pot along with the Persian Limes. Be sure to punch two small holes in each lime. Add Advieh along with broth. Season with salt and pepper. Cook covered for one hour. If you want to replace the protein from meat into this dish you can either add tofu or some types of beans. If using tofu, I would drain the tofu first and then sauté it with the onion and celery initially. Then proceed as seen above. If adding beans I would suggest using one cup of cooked beans at the step where the broth is added. I tried adding a cup of cooked chickpeas to mine and it was pretty good. Small dice onion and mince garlic. Sauté in oil until translucent. 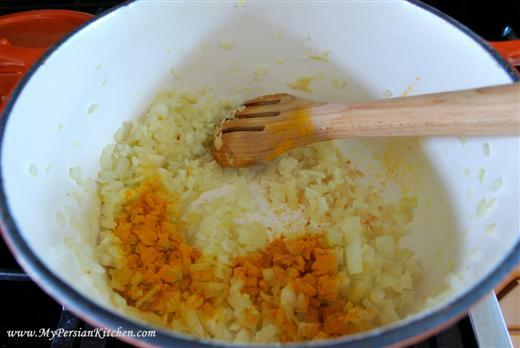 Add turmeric and cook for a few minutes longer. 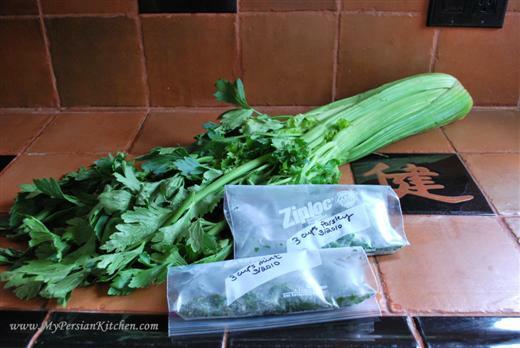 Cut the celery sticks into about 1 inch pieces. Wash and drain all water. 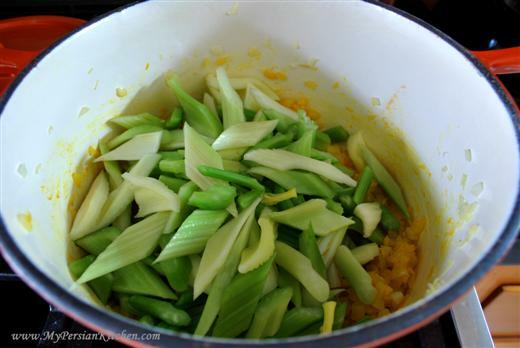 Add celery to the onion and garlic mixture and sauté for a few minutes. 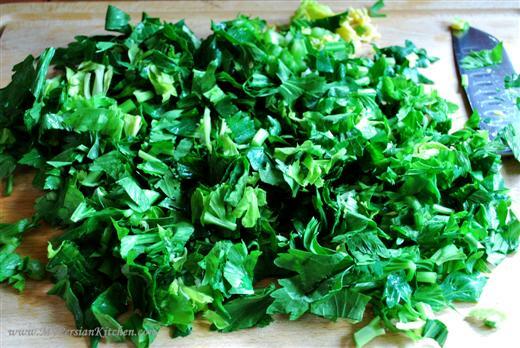 In the mean time chop all the celery leave and herbs. Add the herbs to the pot along with the Persian Limes. Be sure to punch two small holes in each lime. Add Advieh along with broth. Season with salt and pepper. Cook covered for one hour. Love this dish. I make it alot. 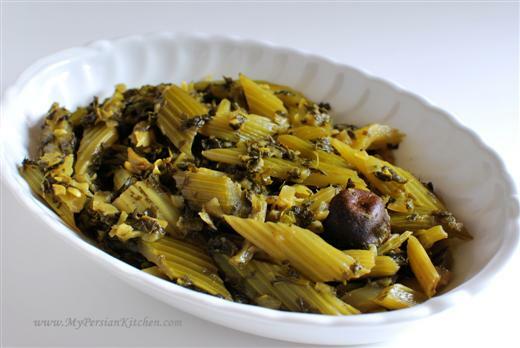 For a bit of different taste, add some sour grape juice (Abe Ghoreh) instead of dried limes. it is soooo good. I have been waiting for my local market to carry the sour grapes. I can’t wait to use them!!! As usual, I love your website and step by step directions with pics. I have been cooking khoresh karafs, gheimeh, ghormeh sabzi, kadoo bademjan vegeterian style for years since my hubby does not like meat. He kept telling me to make it with no meat and I would tell him it won’t turn out good but he insisted and I tried it and you could never tell the meat is missing. The only time he will eat meat is when it’s a kabab or a burger. Anyway, keep up the great work. You rock. Even better, you can add the sour grapes instead. You are lucky to find fresh sour grapes in the market, we can only find bottled juice, which is not bad. @ Ani, thank you for your kind words! I never thought about making any type of khoresht without meat myself before I became a vegetarian. Then I realized how easy it is! When I make it, I usually use chicken or beef, never thought about making it vegetarian. I will have to try this way. Hello Marina, welcome! The closest Persian markets to San Pedro are in Torrance. Both of them are on Hawthorne Blvd and PCH. Hawthorne International Market is on Hawthorne above PCH and the other Shayan Market is on PCH north of Hawthorne. i’m not a vegetarian but i have a lot of family members who are…chickpeas are a great idea- will have to try it. i think sour grapes are in season (or were)…i picked up a lot at the persian market a few weeks ago and froze them – so you might want to check it out. that and albaloo! Lovely karafs khoreshe! I made it yesterday for my husband and his friend, without onion, as his friend has an onion allergy. Tasted delicious none the less. This is a delicious recipe. I added mushrooms too. I love Persian food am glad to see your very helpful website. However I noticed I can’t find the ingredients for the Advieh you mention in many of your dishes…Can you tell me what it contains.